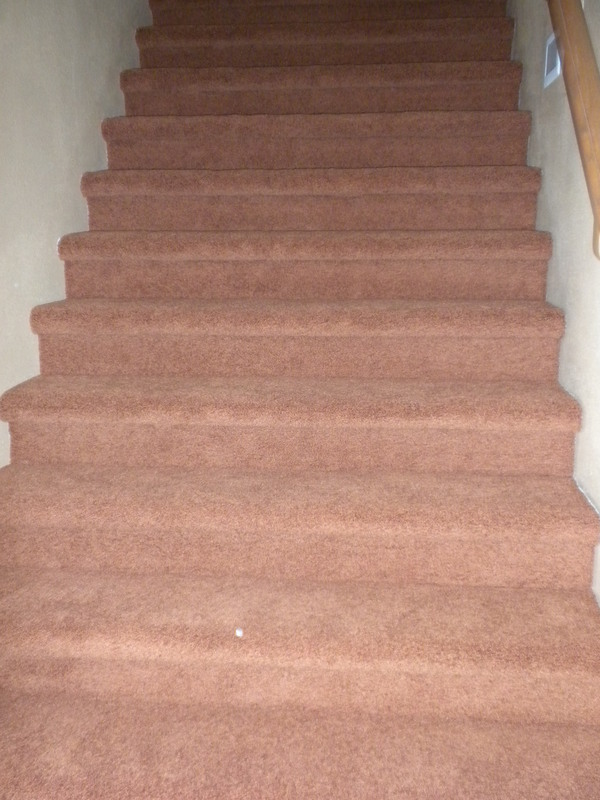 New Carpet – Expect the Unexpected! We have been in the house for 8 years the first week of October and celebrated 9 years in Arizona/USA on August 26th. The time has gone by so quickly. Anyway back to the house. The carpet in the house was still the same as put in at time of building…a beige/grey depending on the light that you look at it in. With 3 dogs and a 3 year old the carpet was starting to look a little dingey and the underlay was giving out in certain areas so we decided that it was time to do this last big job. 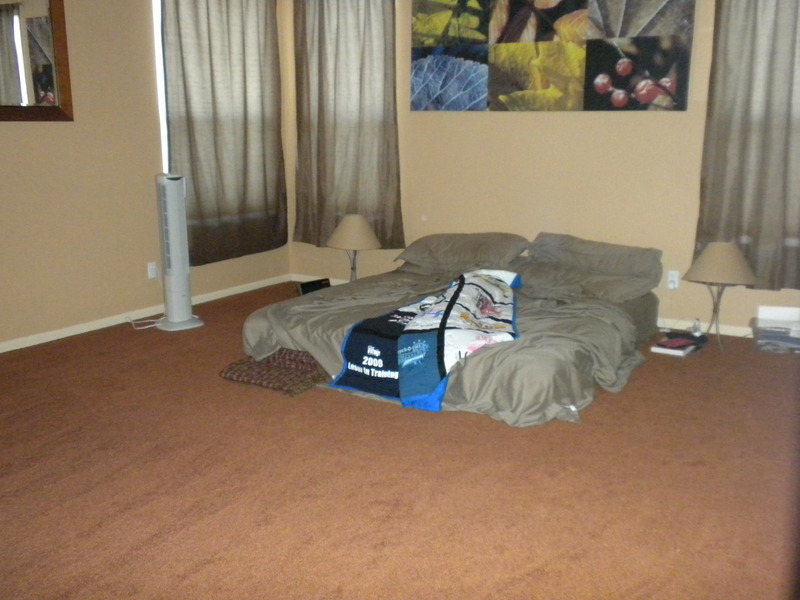 With 2200 sq ft of carpet to be replaced it was not for the weak hearted. Basically the area to be done was all the way upstairs, the entire 2nd floor and also the office downstairs. 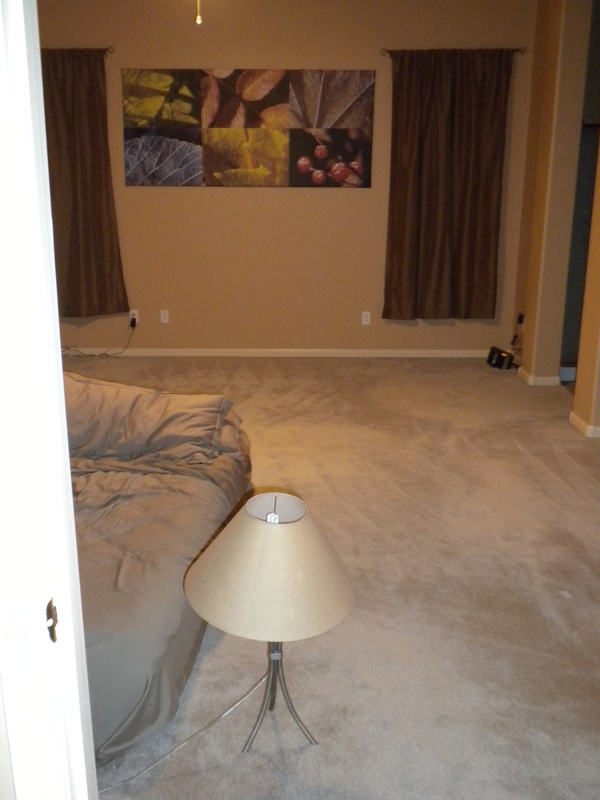 In order to put the carpet in all furniture/boxes/belongings had to be removed off the floor. After receiving the quote for the new carpet which included moving furniture we discovered it did not include dismantling the furniture so we decided that it would be easier to book movers to do the whole job. We booked the movers to come in on Monday and take the large furniture out to the garage and then booked them to come back on Thursday to put everything back in place. 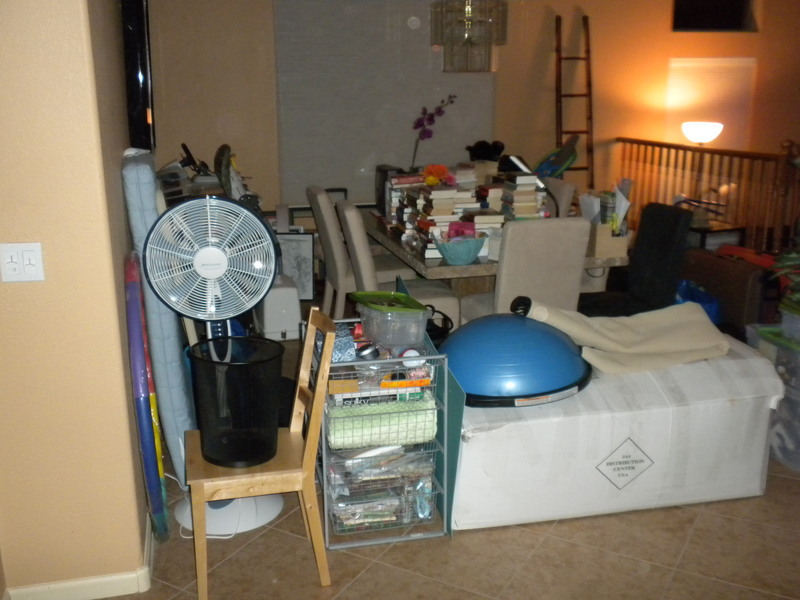 Over the previous couple of weeks John and I had gradually been packing up/moving all the smaller items. We also took the opportunity to do a lot of sorting out and have donated vast quantities to charity. 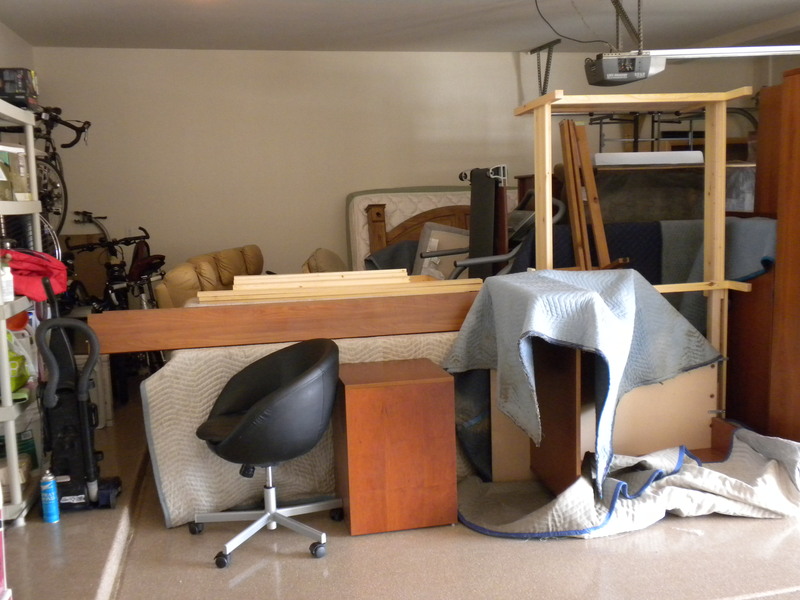 While the larger pieces of furniture such as beds/desks etc all went in the garage and 2 of our cars sat on the driveway the smaller pieces and whatever was boxed up, including the contents of our storage room all went into the formal area. We had expected the carpeting to be a 2-day job so had set aside Tuesday and Wednesday and the movers were booked to come back on Thursday. The carpet guys (2 to start with and then 3 from around lunchtime) informed me that because we had moved out everything they would stay until they were finished on Tuesday. The last man left at around 7.30pm on Tuesday evening having started at 9.45am that morning. We spent Monday – Wednesday nights sleeping on mattresses on the floor which, of course, had to be removed for all the work on Tuesday. Kirsten coped amazingly well and I have to say thank you to some wonderful friends who picked up Kirsten from preschool on Tuesday, Wednesday and Thursday and took her home with them in order to make life a little easier for me. We took a risk and changed the colour up a little. Having had the beige we decided to go with a colour listed as expresso. Many of you know that our walls are gentle coffees/chocolate so we hoped the carpet would highlight this. It was very difficult as the only sample we had was 2 x 1 inch and when we went back to Lowes another sample almost looked orange. We kept our fingers crossed and hoped for the best. I dropped Kirsten off at preschool on Tuesday morning and headed home. I called John en-route as I passed a pick-up truck laden down with carpet and based on the colour of the large roll on the roof I decided it must be ours. I took the shortcut home and sure enough 5 minutes after I got home the pickup pulled up by the house. Thankfully the colour was everything we hoped that it would be. As they needed the space of the driveway for cutting I moved both my Odyssey and John’s Golf over onto a neighbour’s drive as the house is a second home so was sitting empty for last week at least. Now the other news. Some of you picked up through my twitter feed that we made a discovery on lifting the carpet in the office. Yup a large puddle. This turned out to be caused by a hole in the condensation pipe of the air conditioning unit and had we changed our carpet over the winter when the air conditioning isn’t in use it would have stayed hidden. It turns out the hole was caused during construction of the house 11 years ago and it had been spray painted bright orange to say “fix me” but was never fixed. We’re lucky there wasn’t more damage. I will give you more information on the leak and work being done with pictures in a post in another day’s time as this post is long enough. Anyway i think I’ll give you just 1 or 2 more pictures showing you the finished product. Sorry this is such a lengthy post and as I said there will be another in the next couple of days showing you the goings on with the locating/fixing of our leak. I hope you like the colour of our new carpet. We are really pleased with it and hope it will last as long, if not longer, than the carpet we have just taken out. You are currently browsing the John and Sigrid's blog blog archives for September, 2010. Beads by Laura Laura is British and makes fabulous beads. John and Sigrid's blog A bit silly I know as this is a link back to exactly what you are reading. John Sigrid This is the blog of a totally different John and Sigrid that was discovered. Material Obsession A store in Sydney, Australia with some amazing quilt patterns. Taffy Talk Another great quilting blog that Sigrid is following regularly. The Olde World Quilt Shoppe Our local quilting shop here in Cave Creek/Carefree/North Scottsdale. Kirsten and I love Jordan, Dee and Whitney!